Participants are encouraged to arrive in Sao Paolo on March 10. Your institution will be responsible for travel expenses to and from Sao Paolo and lodging expenses at the hotel. 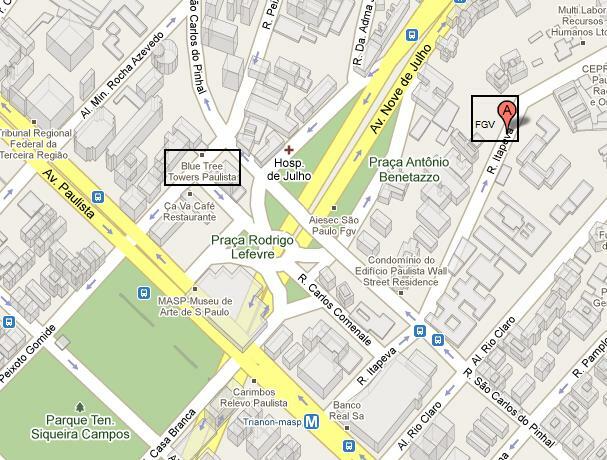 We have special hotel rate at the Blue Tree Towers, located at Rua Peixoto Gomide, 707. To place your reservation, please email the hotel at reservas.paulista@bluetree.com.br and mention the code Latin Moot Corp/FGV. The rate will be R$ 194,00 for a single room and R$ 223,00 for a double room. During the Competition, we will provide some meals for you and your team. This entry was posted on Wednesday, February 24th, 2010 at 8:35 pm and is filed under Uncategorized. You can follow any responses to this entry through the RSS 2.0 feed. You can leave a response, or trackback from your own site.